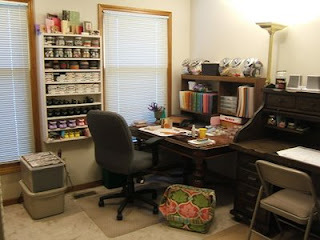 Michelle Wooderson has uploaded images and explanation of her studio. As I can\t find a way to contact her to ask for permission to post pictures here, I can't show them to you here. But, if you click here you will find her post. 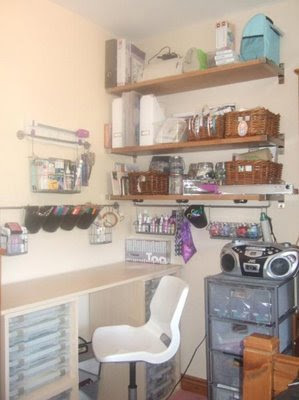 I specially like the pegboard used to store ribbon and the magnetic tins store upside down to maximize storage room. Click here to see more photos and her explanation -she is a funny lady, so it's always a good read. For the main page of her blog, click here. 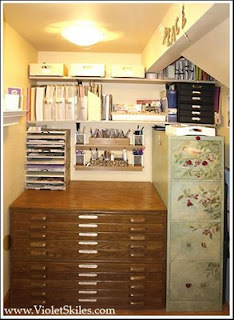 I love the use of an old type drawer. So if you would like to know how Becca has done it step by step click here. And for the main page of her blog, click here. Long time ago, Patti Beham sent me the link to her blog entry on how to make this lovely little set of foam storage drawers, and of course, somehow I have only now manage to post it. What I like about the project is the crafty aspect of it. 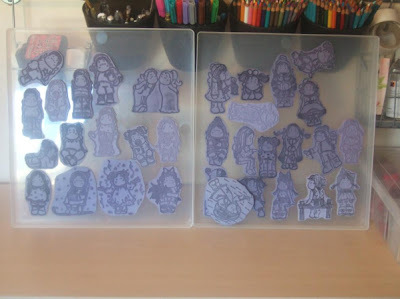 It is 50% papercraft project, 50% storage project. If you would like to see how it is done, click here -there is even a video. 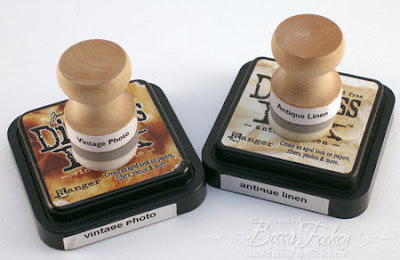 Love this studio, a true stampers one, with everything very nicely organized. It belongs to Dawn McVey, you can go to her blog so check her great projects here. and if you fancy more pictures of her studio, click here. When it comes to beautiful studios, well this is pretty much up there with the best. 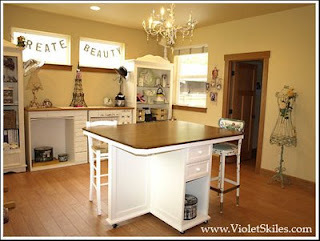 I particularly the island in the middle that is high for scrapping but with Violet has a two stools as well. Also I loved the Closet. I think it is perfect to take note of how to take advantage of small and weirdly shaped areas. And of course this wood unit ... makes me want one! For more photos and proper explanation by Violet, click here. Dina uses a rail to store punches and the Nestabilities. For the latter ones, Dina got some S hooks from Ikea (the rails are from there too) and then made little tags so she could know what they are. You can see more photos and explanation here. A clever idea using straws to hold small amounts of ribbon. 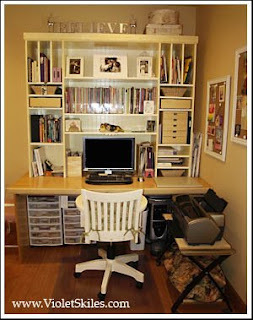 You can see more photos and more ideas here. This is a picture of the whole space. It doesn't look much but you should have seen the amount of space i used to work in. 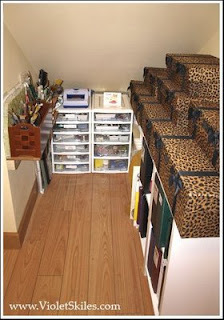 This is like crafting in Paradise compared to before......lol. 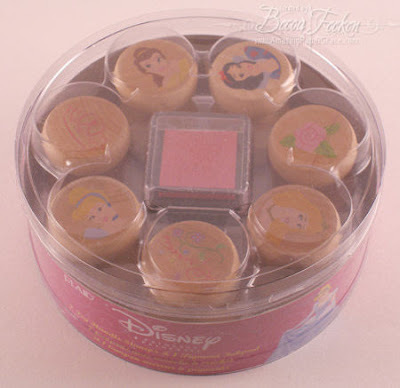 To store the unmounted stamps Emma uses clear 12x12 boxes which are 1" wide allowing her to use top and bottom to stick my stamps on. 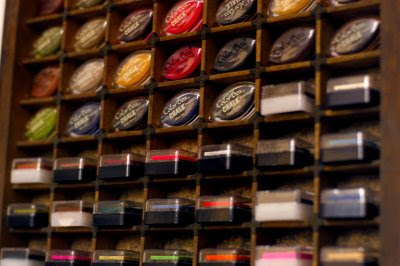 Wooden stamps are kept in the thinner satchels top right hand side of the desk. to see more pictures of Emma's studio click here. For the main page of Emma's blog, click here.